Check out our new 300 ft runway! Welcome to the Central Florida Sport Flyers (CFSF) website. 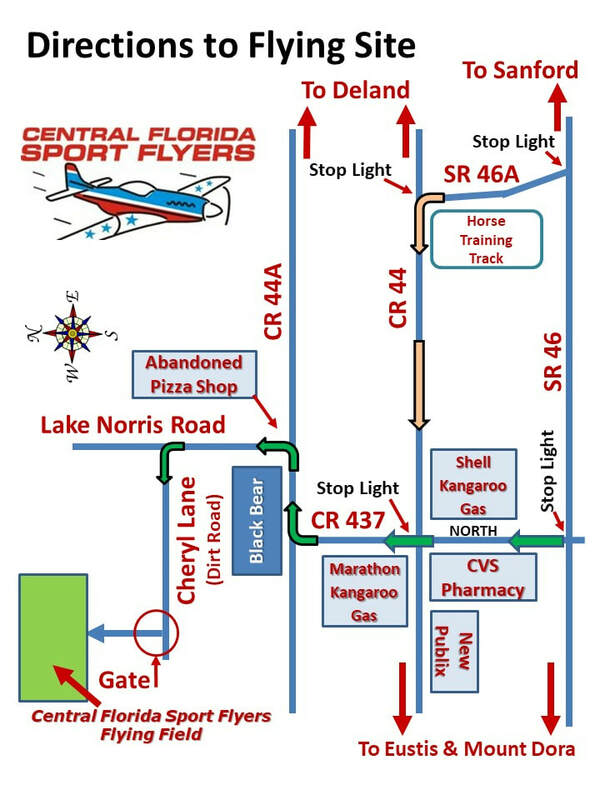 The Central Florida Sport Flyers are a small group of approximately 20 RC model enthusiasts that welcome Gas, Nitro, and electric powered RC aircraft, Ducted Fan model jets, RC helicopters, powered and non-powered gliders, and drones of all types. As a result of our small membership size, there are no long waiting times to fly, as with many larger clubs. We have been an AMA sanctioned and chartered RC club (#3587) since 1996. Our flying field is approximately 50 acres that is located at 37711 Lake Norris Road in Eustis, Florida. We are conveniently located near the localities and cities of Mount Dora, Tavares, Leesburg, Mount Plymouth, Umatilla, Sanford, Sorrento, and Eustis. This location can be found is just past the Black Bear Golf Course, also on Lake Norris Road. For your RC flying enjoyment, we have also just installed a new 300 foot fabric runway. (See website photos and video) We have plenty of parking space, restroom facilities, and electricity for charging batteries. Our flying field is located on private property, and is open to members seven (7) days a week from about 7:45 AM until dark. Since we are located on private property, our landlord requires access using a member authorized gate code. As a result, you will not be able to access our flying site without being the guest of a current member. Our membership is open, and we welcome anyone that shares our interest in model aviation and would like to become a new member. We also have Junior memberships, at reduced dues, for persons 18 years of age or younger. We also have multiple RC aircraft and RC helicopter instructor pilots to help you get started properly in the RC hobby. If you would like to visit our flying field and fly as a visitor with us, please contact Walt Tillman (President) by cell phone at 804-815-2227 or email at waltt26@gmail.com. or Jim Nevill (Vice President) at 586-709-3194 or email at jnevill@gmail.com. AMA membership is required to fly at the CFSF flying field, so please bring your AMA card. If you know one of our current members, you are also welcome to visit our flying field and fly with us as their guest. Printable membership applications are available on this website should you desire to join our RC club. If you have additional questions, or need more information, please contact us at your convenience. I look forward to meeting you in person and flying with you as a potential new CFSF member. Welcome!